LAKE NEW MELONES (CALIFORNIA)Escape to California's Central Sierra Gold Country at Lake New Melones boat rental vacations, and chartered boat tours; Invert Sports offers amazing houseboat rentals, and jet ski rentals. Magnificent scenery, miles of secluded shoreline, fantastic boating and fishing, sea doo rentals, waverunner rentals, and clear water make New Melones Lake the perfect place for a day trip or extended family vacation year 'round! Lake New Melones large reservoir offers a multitude of recreational opportunities - boating, swimming, fishing, water skiing lessons, wakeboard lessons, flyboarding, wakesurfing lessons, and stand up paddle boarding. Lake New Melones has shoreline camping, lake tours, and of course house boating rentals. Invert Sports offers water sport vacation adventures at Lake new Melones. Call today for your Lake New Melones boating vacation. Today New Melones Lake provides irrigation water, hydroelectric power, flood control, wildlife habitat, fishing, camping, boating recreation, and other recreation as part of the Glory Hole Recreation Area. 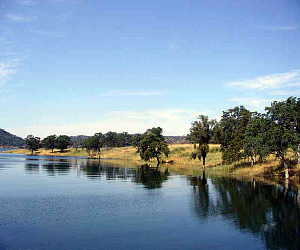 The New Melones Project was authorized in 1944 to create a much larger reservoir for boating charters, jet ski rentals, and water sport activities. It would also be specifically designed to prevent floods.